DESCRIPTION & INGREDIENTS: Black Sunflower, Roasted Peanuts, White Millet, Corn, Safflower, Rendered Beef Suet, Oats, Gelatin, Blueberries, Soy Oil, Artificial Cherry Flavoring. 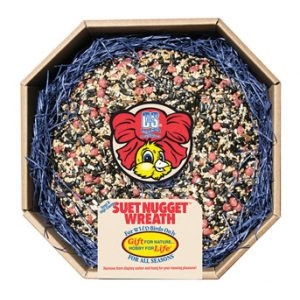 Our Seed Wreath is the perfect gift for the wild birds that provide feeding enjoyment year round. Made the same way as our Wild Bird Snak™ products, and is a great gift idea for the bird lover! Great Wild Bird acceptance all year long.